We all love paracord for its multitude of uses - both survivalists and DIYers alike. People use paracord in camping, sporting, source of income, and as a fun crafting project. A bracelet is the best example of what most people make for use in a survival situation and as a DIY project. The options are endless; there are hunders (if not thousands) of knots, weaves, and colors to try. 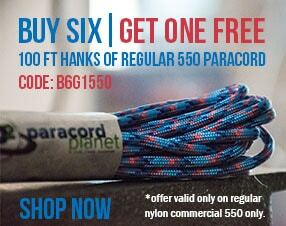 But the best thing is nearly every single day I find something new to use paracord for (see #4 - #6 below). The most common use today for paracord is for crafting fun and unique projects - bracelets, monkey fists, handles, and jewelry. But what are some other handy uses for your paracord? Here you will find 6 alternative uses for your paracord - both fun and practical. You never know what can happen when you're camping, on a hunting trip, or just taking a hike. If there's an accident and you're wearing your paracord bracelet or just have some loose paracord on you, you can use it as a tourniquet to slow down the blood flow for a period of time. You never know when you'll be caught in a bad situation and have no medical supplies on you. As the saying goes, it's better to be safe than sorry. Know what you have on you and use it to your advantage. A tire swing is a fun common household item that you jazz up with paracord.You can do a weave with 550 cord for the strings and make them fun color. It can be a fun weekend project to do with your kids- make some weaves for the rope (round braid, 4 strand braid, fishtail would be fun ones), paint the tire, and find the perfect tree to hang it from. Click here to see our instructional videos for weaves to try. Fortunately to some, but unfortunately to more, it's winter. Whether you like it or not. What a better way to make a boring, cold winter day exciting than going sledding. A paracord sled rope is another fun way to personalize your stuff. This is such an easy way to make your sled unique. In a time when most sleds come from department stores, make sure no one accidentally takes yours. The paracord can be made thicker with some fun weaves and your child's favorite color can be used to make it. You can also show off your paracord skills and make a knot to secure the paracord to the sled. Click here for some knots to try. 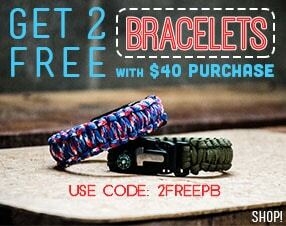 Click here to see our multi colored paracord. I love camping so I must say, this is one I'm going try! Have you ever tripped over tent strings? Or had someone trip over yours? Sober or after a few drinks, people can easily trip in the dark over something they can't even see. No more. Using glow in the dark cord will surely save you trips, face plants, scraped palms and knees, and embarrassment. Also, it just looks cool. You'll be the hit of the campground! Click here to see our Glow Cord. Paracord can help in nearly every situation - for its strength, durability, and ease of carrying. Another cool way I recently learned was a pull cord for lawn mower, snow blowers, weed wackers, etc... Paracord can really get you out of a pinch and these house hold items are not things that are cheap to fix. Why not try to fix it yourself? Besides, who doesn't get a good feeling after fixing something by yourself? Learn how to make your own paracord pull cord here. This is also one I haven't seen before but love. You can really put some character into your tailgate with fun colors and weaves. Here is another boring winter day project to work on before summer bon fires and football tailgating starts. Who knows? Everyone could really love it and then you have a fun crafting weekend on your calendar! Do you have any other alternative uses for paracord?